Our shop in National City, CA uses the emissions diagnostic technology to get you on the road safely and quickly. We pride ourselves in customer service & we work hard to ensure we provide the best customer experience in National City, CA. 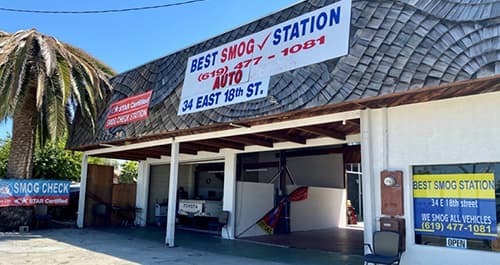 Whatever your smog check needs, look no further than Best Smog Station! Get in touch with us today! At Best Smog Station in National City, we are focused on providing accurate smog checks. We have years of experience in delivering results and with the highest levels of customer satisfaction. Make sure your vehicle is properly certified with smog testing from our Best Smog Station with our National City Emissions Testing Center. We inspect your car and make sure it has all the parts as required by the state. We test the emissions to ensure that your vehicle is not releasing pollutant emissions from its tailpipe. These smog tests help cut down on pollution levels in the air, as well as keep your car running efficiently. We are fully capable of testing vehicles, including diesel vehicles, cars, SUVs, trucks, vans, and RVs.